cutest lamp ever! love! Great weight and nice shade for the money . Safavieh Lighting 13-inch Eunice Table Lamp - 9" x 9" x 13"
Safavieh Lighting 14-inch Mable Table Lamp - 10" x 10" x 14"
Down on one knee in London's Barclay Square, the beauty and depth of his proposal made the ring's 3 karat diamond seem demure. Inspired by her epic moment, the designer of this shimmering crystal table lamp created an heirloom beloved for generations. Dimensions 9" X 9" X 13"
I am very pleased with quality of Safavieh brand products. 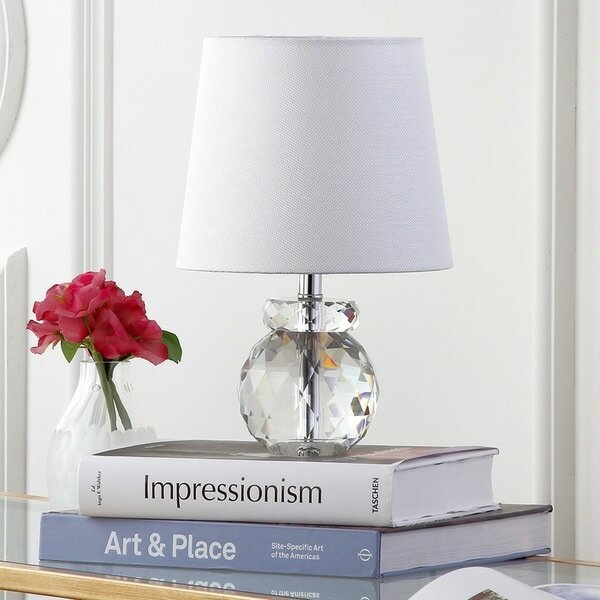 This delightful table lamp adds a touch of elegance to the room. It is made with higher quality materials. The crystals illuminate beautifully at night. I could not be happier with this purchase. This is a very sturdy lamp. 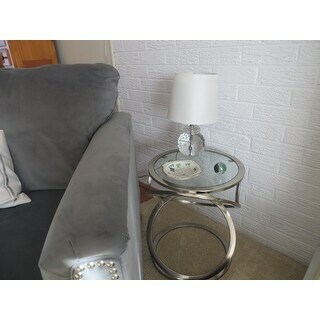 I love the look of the crystal and the small size is just right for my side table. When the sun comes through in the afternoon, pretty little colors are projected across the room for a lovely effect. Love these little lamps. Got them because I hate overhead lighting and dark rooms. They are perfect, soft lighting and appealing to the eye. This lamp is absolutely beautiful. It is small but a piece of art in its own right. It is heavy and very high quality. I highly recommend to anyone looking for a small but elegant lamp. Lovely lamp base. Ugly cord....silvery gray and heavy braided finish not a good feature for a crystal lamp. Shade is very poor quality, also not a good match for crystal base. Replaced shade and looking for decorative cord cover. We put this gorgeous little piece, on our bar. It adds a soft light and illuminates our collected crystal we have placed on a mirrored bar tray. It has a very expensive look. I bought it when it was on sale. What a great deal! I just love it! This little lamp arrived today. It is perfect for the dresser in my bedroom. I was very impressed with the packaging for this lamp - very secure, but with little to no superfluous, non-recyclable materials. The lamp is very heavy and solid - I love it! this lamp is beautiful, and even more beautiful when lit.....it's the perfect birthday gift for my mom. I might have to get one for myself!! In love with this lamp. It’s very heavy, which I like, because in a house with a cat that makes it hard to knock off an end table. Love this lamp! Fits perfectly on my bedside night table. Gorgeous for the price $$$. The pretty little lamp in my granddaughter's room. She just loves. Very sparkling, I order by mistake but happy about this purchase. I would order it again. "What is the highest bulb wattage that can be placed in this lamp? " A 9 watt bulb is included. "Can the lampshade be switched out?" This lamp shade is not removable. Safavieh Lighting 27.5-inch Crystal Ice Palace Crystal Table Lamp - 15" x 15" x 27.5"
Safavieh Lighting 21-inch Deco White Shade Prisms Crystal Table Lamp (Set of 2) - 12" x 12" x 24.5"